I previously posted about Bible stories being depicted with Legos. 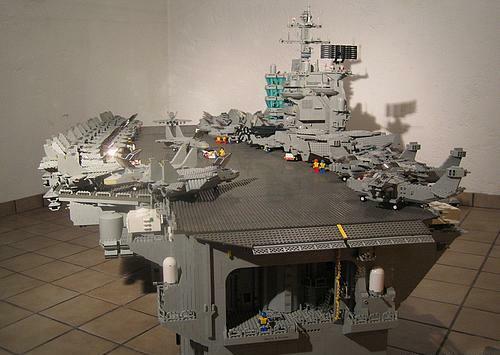 Well check out this aircraft carrier: Lego Aircraft Carrier. I assembled one of those 3-D Puzzles (Neushwanstein Castle) when my leg was busted back in high school. It took a couple full days to get the whole thing together, so I can imagine the dedication it takes to put together such elaborate creations with Legos. Airbus worked with BMW to come up with the interior for the A350. I’ve got to get me one of the these! 🙂 The business-class ride in one of these planes will be pretty comfy according to the specs quoted in the article. Posted by Q in Friends, Links, Random, Video. Text messaging bigger than Hollywood? :We find this one a little hard to believe, but according to at least one set of stats, text messaging is a bigger business than the movie industry. Revenues for texting in 2005 were about $75 billion, vs. $30 billion for Hollywood. Text is even bigger than the video game biz, which only brings in $40 billion. And, to top it off, texting has a 90% profit margin. Given that texting is bigger than the movie business, we assume it’s only a matter of time before it has its own stars and scandals. Oh, wait, it’s already got that, right Paris? Posted by Q in Friends, Random, Travel. D, RJ, RJ’s friend, and I went down to Fisherman’s Wharf in San Fran today (pictures forthcoming). D and I parked the car at a 1hr, metered spot, and as we were headed to meet RJ and his friend, we saw a spot open up in the free, 4hr parking area. D runs to get the car and I stand in the spot. Just before D turns the corner, this old guy in drives up in a Jetta. I wave him off. He then rolls down his window down as yells, “You can’t save spots. You don’t own the city you know!” Just then D pulls up and parks in the spot. For a moment I felt bad. Then I remembered: the city is mine. Posted by Q in Links, Random, Video. Here’s another long overdue link. Check out this episode of Who’s Line is it Anyway? with Richard Simmons as the guess. This thing had me rolling the first time I saw it. There are a bunch of links I have been meaning to blog. This is one of them: Kosovo Its a fun take on the Beach Boys song Kokomo. It’s not a new video (found it a while back) but I still get a chuckle out of it.